Blasting alerts to the public during a major crisis has become more than an exercise in traditional broadcasting technology. Sociology now plays a major role, as state and local officials try to cut through an information overload and tailor citizen-centric alert systems to dispatch messages to mobile phones, e-mail devices and other technologies. Localities are no longer relying exclusively on the Emergency Alert System — formerly the Emergency Broadcast System — and its familiar squeal that emanates from TV and radio stations to signal disaster. Because the public has changed how it communicates and accesses information, local officials are devising a variety of ways to notify people of impending crises, whether those relate to homeland security or natural disasters. A small crop of vendors is rushing forward with technical solutions to help localities better reach citizens. Called mass notification systems (MNS), many of the solutions have materialized as hosted offerings, in which the government pays for an alerting service from a third-party provider. Specific technology behind MNS alternatives varies. Some vendors offer software that resides on servers and blasts a single alert message to multiple channels using voice or text notification methods. Meanwhile, others are pushing the use of low-cost FM receiver chips and are working with local radio stations to deliver alerts. Now that alert systems can deliver messages to a mix of devices, most municipalities want to augment, not replace, traditional media alerts with new MNS technology. Contra Costa County’s citizen alert system is multifaceted. For example, the county has planted a large number of low-profile sirens throughout local areas to sound alerts if necessary. The county is also testing a wireless message alert system from SquareLoop, a location-based services provider, for cellular phones and other wireless devices. SquareLoop Mobile Alert Network takes into account that wireless users quickly suffer “alert fatigue” and seeks to deliver only the most relevant warnings based on a subscriber’s precise location. Because messages flow from transmitters affixed to particular cell towers and are not tied to individually identified subscribers, local government customers can target messages by location without stepping into privacy-sensitive areas that surround the collection of tracking data. To become part of SquareLoop’s Mobile Alert Network, subscribers download from wireless carriers a free software applet that lets them receive alerts from local government agencies. “The application on the phone receives this message and determines if it is relevant for the subscriber based on location and timeframe,” said Joe Walsh, SquareLoop’s director of business development and operations. “You can’t send everything to everybody or alert fatigue sets in,” Walsh said. Local agencies using Mobile Alert Network try to avoid sending too many alerts by using the system’s Tactical Display Interface, which is a Web-based interface that agency officials can use to draw a box on a map to indicate which area should receive a message. Decision-makers in Columbia County, Ga., also realize that swamping citizens with excessive alerts can be detrimental. “Since each person is different, we must find ways we can communicate with each one of our citizens to alert and update them on encroaching hazards and advise them on how to best prepare for these threats at any time and at a moment’s notice,” said Pam Tucker, director of Columbia County’s Office of Emergency Services. The county blends three systems to inform people during crises. One system uses local broadcasts derived from the National Oceanic and Atmospheric Administration’s Weather Radio All Hazards nationwide network of radio stations. The second one is the Federal Communication Commission’s Emergency Alert System, which issues follow-up information on a range of hazards, including homeland security and public safety incidents. Columbia County has also built a phone notification system to communicate with residents using Communicator NXT, a Web-based notification solution offered by Dialogic Communications Corp. (DCC). One component of the system jets messages to selected groups, such as people who live within a one-mile radius of a chemical plant. A second portion of the system — dubbed GeoCast — allows state emergency workers to send messages to individuals in a specific geographic area. Because rapid-fire messages delivered to wireless devices can become tangled with unwanted marketing text and test the patience of alert-weary citizens, some MNS solution providers are encouraging municipalities to explore other means of notifying the public in times of crisis. For instance, Global Security Systems (GSS) offers its GSSNet First Alert system, which enables local officials to send text messages over FM radio signals to designated groups of people through Global Position System technology. First Alert relies on use of an FM receiver chip, which can be embedded in dedicated devices, cell phones or handheld computers. First Alert users can also choose to put the chips in common household devices, such as smoke detectors, said Robert Adams, GSS’ president and chief executive officer. The Federal Emergency Management Agency and Mississippi’s Office of Homeland Security tested First Alert in July with the help of the state’s public broadcasting network, which lent the use of its radio tower. Mississippi has since enlisted 30 radio stations that are willing to distribute secure emergency alerts. “Now that the system is in place throughout the state, it is up to the counties and municipalities to step up and use the system to its full capabilities,” said Ed Worthington, former director of Mississippi’s Office of Homeland Security. Worthington is now an outside consultant and president of Ed Worthington and Associates. Louisiana’s Office of Homeland Security and Emergency Preparedness is also contemplating a statewide public notification system, said Ricky Edwards, sheriff and director of the Office of Emergency Preparedness in Jefferson Davis Parish, La. “Messaging never went down during hurricanes Katrina and Rita, while phone service was disrupted and is — in some cases — still out,” he said, emphasizing the need for alternative means of public alert. Jefferson Davis Parish has tapped Roam Secure, maker of the Roam Secure Alert Network, which also lets local officials send disaster-related information to e-mail accounts, cell phones, pagers, Research in Motion BlackBerries and other wireless devices. Local agencies can run the network’s software on their servers or purchase the application as a hosted service. Local homeland security, emergency preparedness and law enforcement agencies tend to take the lead in adopting technology to reach citizens during disasters. However, some public alert system efforts stem from other local departments. For instance, the Palm Beach County, Fla., School District has taken an active role in public outreach by piggybacking disaster-related messaging on a system used to track student absenteeism and truancy. “During Hurricane Wilma, we used the system as a way to communicate with parents and employees to report damage to schools and to note the schools that had been shut down,” said Helen Hironimus, who works in the district’s Network and Applications Support II division. Like Columbia County, the school district uses DCC’s Communicator NXT software. 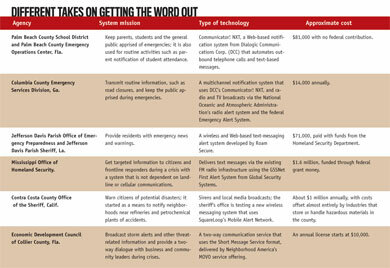 The system facilitates the delivery of alerts to students’ home phones, cell phones, e-mail accounts, faxes and pagers. Palm Beach County’s Emergency Operations Center also maintains citizen-alert applications but can easily use the school district’s system if necessary, Hironimus said. Although cost is almost certainly a factor for all local governments contemplating the adoption of citizen-alert systems, most officials realize they must reach out on several fronts to successfully contact as many people as possible. Outsourcing the workLocal agencies are increasingly turning to hosted solutions to reach citizens through mass notification systems (MNS). MNS providers run data centers outfitted with all the necessary databases, specialty application servers and storage devices, along with data replication software. Typically, these vendors lease dedicated phone lines from a variety of carriers to deliver voice and text messages to the public, Vining said. In the future, the MNS market is likely to become more specialized. Hosted systems “and the entire MNS market will become further segmented into particular groups, such as government operations, business continuity and educational alert efforts,” Vining said.